One of the common signals from the mid 20th century was the searchlight signal. Many companies have created model versions of these signals over the years. The problem has been lighting them realistically, especially in the smaller scales. 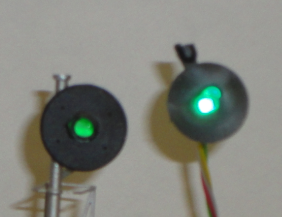 The usual method that is chosen to light these signals is to use a dual color (red/green) LED and take advantage of the fact that the eye will blend the red and green into a yellowish color when they are both lighted. In order to get these blended colors both the red and green must be lighted at the same time, or nearly enough that the eye can not tell. For the three lead version of the two color LED this is not too difficult because each LED has its own connection. However one common two color LED uses reversed polarity to light one color or the other. 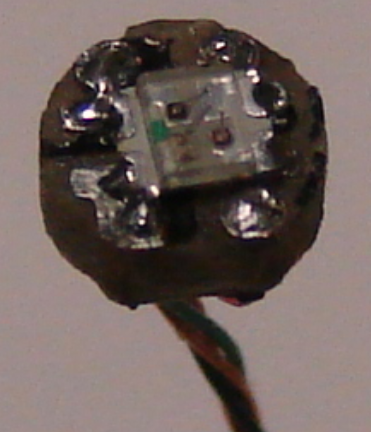 To drive these LEDs a circuit must be devised to rapidly reverse the polarity driving the LEDs. We created the SDB-4 board especially for this purpose. In spite of having an adjustment that would allow the user to easily change the proportion of red and green colors it was still nearly impossible to create a realistic yellow color, especially as the user would move his vantage point. This was mainly due to the fact that the front of a LED is actually a domed lens, and the two color chips are not possible to mount at the same location internal to the LED. This means that as the viewer moves his head he sees more or less of each chip at the focal point of the lens. More simply put, he sees the red or green more in focus from different view points. The only way to get a good yellow is to use just one eye, and only from a fixed position. The solution to this is obvious. You need to have a three color LED, not a two color LED. 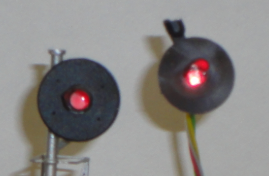 Unfortunately all the readily available three color LEDs that are small enough to fit into a small signal head are the primary light colors of Red, Green, and Blue, not the signal colors of Red, Green, and Yellow. Furthermore the primary color green and the RR signal green are not the same. To solve this issue we contacted a major LED manufacturer and special ordered a three color LED. Because it was a special order in the first place we were able to also specify the proper colors for each LED. The advantage of using the three color LED is that not only do you get the proper three colors, but the wiring is the same as it would be for any other three color signal. The disadvantage for us as a manufacturer is the difficulty and time required in soldering four very small (#36AWG) wires onto a 3mm diameter circuit board that has the LED mounted on it. The wires to the circuit board are color coded red, green, amber, and dark blue. The dark blue wire is the common anode connection. 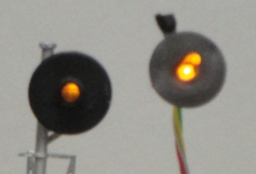 The following images show our 3 color LED mounted into a simple Oregon Rail Supply signal head as compared with another popular searchlight signal. In these photos both signals are being driven from identical circuits at the same current. (4ASD-4) The black chunk is the original sprue which I did not remove. The 3mm circuit board was simply inserted into the rear of the Oregon Rail Supply head. It could just as well have been inserted into any other head with sufficient opening for a 3mm LED. The reason the 3 color LED appears to be so much brighter, even washing out the colors in these photos, is that you are looking directly at the chip. The other signal has to locate its individual LEDs down inside of the housing for sufficient space, and then reflect the light through a clear plastic light pipe to the front of the signal. RR-CirKits SS-RGY-18 LED with 18" #36AWG color coded wires.